Laura Diaz is a professional trained life coach, a Board-Certified Coach. (B.C.C.) 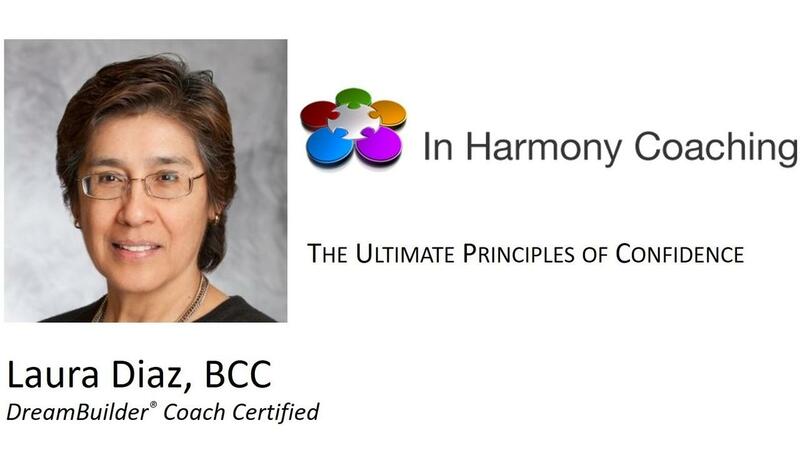 She is the founder of In Harmony Coaching, which is a company whose mission is to inspire and increase an individual's self-confidence, so that they can create a life they love. She is also a certified Dreambuilder Coach with the Life Mastery Institute. Laura coaching focus is helping women in transition, identify and build their dreams. She uses a process of navigating the gaps and helping her clients overcome obstacles in pursue of their plan. For over 30 years, Laura has been studying and implementing transformational success principles that she uses in her personal life as well as her business. Laura is a speaker and she has monthly seminars throughout San Diego county. As a Dreambuilder Coach, she helps people discover their dreams, take action steps toward their dreams, and help them navigate the gap between their old and new paradigms. She is passionate about helping her clients live from a point of power within. If you're looking to gain clarity, confidence and achieve your next level of success, while enjoying the highest level of fulfillment in life, Laura's coaching programs can help you get there. My client are professional women between late 30s and early 70s who are interested in building their career, business or their personal leadership. I also facilitate the DreamBuilder 12-week coaching program to help clients identify what they really want and create a vision for their future, as well, as help with tools to navigate challenges. Board Certified Coach (BCC) with Center for Credentialing & Education, Inc.